But suddenly that post was gone, and so was it’s poster. Well, you’d suppose that was the end of Spaced Ranger. Au contraire mon Original Trilogy! He-e-e-e’s BA-A-A-A-CK !! I’m forgiven! Jay and his moderators of The Forum have taken me back. I’m immortal again! Omnipotent again! Oh don’t fret, Jay. My good fortune is your bad pron! As myself, you have my ever lasting gratitude . . . in this my new icon of Honor, which I will proudly wear (notice my clever overwriting of your “ban symbol” with my original icon) . . . Yes, once again, I’m posting in your forum . . . until your next arbitrary ban. Ah, but before I finish, there’s a debt I wish to repay to our “professor” of forum etiquette . . .
What can you do? These things happen. Your IP address (50.116.49.225) has been banned. The Kodak publication itself is now only at Internet Archive – Internet Archive - KODAK Motion Picture Film: H-1. PDF files also have been saved by IA but one is missing - pp.80-85. Look at the top corners of Luke’s canopy, there [is] … a failed attempt to address the transparency issue? There’s another bleed-through after the rebels identify the Empire’s spy-droids. Space is filled with the Empire’s Star Destroyer fleet, exhaust ports flair bright white. Another ship moves into view and eclipses all of them by it’s shear size. As the other ships are blocked from view, their engines flair are weakly visible through the new ship. Is this on the original film … or is the scan pulling image from other frames (for noise reduction, or such)? I’ve looked around and found this at http://fletcher.github.io/MultiMarkdown-5/tables.html . Is this what you are programming towards? Or is the present grid, spacing, etc., OT’s design? I’ve talked to Ben Burtt and those scenes never even had the score laid down, or proper sound effects done, … when I ask if another cut could have been made with extra scenes added or removed from Star Wars, they literally laugh out loud. Okay, you can tell us then … Luke did throw his grappling hook … twice, right? First time he missed and stepped back to reloop as the Princess traded shots with the storm troopers. Second time he hooks it. Right? I’ll whip up a quick example for a scene I have multiple prints of. About that before/after demonstration … S T U N N I N G! I knew of this technique (from motion-compensated temporal “frame stacking” – but with the downside of noticeable temporal “grain crawl” at too-wide a range) but never thought to apply it in your manner (for multiple-source frame stacking). Absolutely stunning. Would any pre-processing (maybe some temporal stacking) help on the worse layer(s), while not negating the source stacking effectiveness? That is excellent (and I love your visualizations)! The interesting thing is that this approach also might be useful in things like up-rez via vector reconstruction (must hit the math books for that one) or sharpening via vector calculus boundary redistribution (more math books). … what if we paid to fly him out to the scanner instead? Looking at the markdown-it demo noted on each new-post entry page, their demonstration table follows the previous design. (Even then, only a few features worked on OT.) I guess they haven’t updated that old demo. Is there a design doc, to post, which is the target implementation for OT? It would be helpful to future-proof postings while the tables are transitioning. will search only Original Trilogy for these search terms. Ah, the secret’s out! That is awesome quality you pulled out of GOUT with your proprietary process®! Seriously, hire the best lawyers you can to market this! And when you’ve made your billions please remember your poor friends over here at OriginalTrilogy. here is Reel1 of the UK print with sprockets, soundtrack and audio. My favorite extras! Thanks for an early Cyber-Monday gift. Yes, I see this happen to allot of movies. I once tried a Forbidden Planet releases compare and it was just like this compare (I thought it was LD-to-DVD but couldn’t find the LD cap online; maybe it was an MGM-to-WB DVD compare). Doing this section, I noticed that when the 35mm-Italian substituted their Italian text graphics, they did not fully cover the original graphics frame-count. In this instance, which I noticed (difficult because the scan levels vary between the two films), they let the original “blank screen” continue for many frames before inserting their graphics; same thing when the original graphics stopped – they eventually stop their graphics and let the original’s blank screen continue into the next shot. My guess is happens all the time – so be on the look-out for it in all my previous (and probably wrong) divisions when the inserted Italian graphics are involved. Too bad I couldn’t find a laserdisc letterbox cap of this, which I’d estimate would be somewhere in between these two. AND, could this be a long lost concept picture of Gene Roddenberry’s Star Trek? But with 6 days to go, why is there a bidding duel? No one can win an auction at day 6 ! Don’t they know they’re only driving up the price? Snipe, people! At the last 10 seconds, take your best shot! I made a quick resize and color correction just to see what it looks like. It looks do-able, but it looks like to be a Disney-style locked & filled-in background plate. Movement of the “hand” from set photos might be done link-by-link (twists, turns, perspectives), frame-by-frame. That would take quite a long time, unless someone figures an acceptably looking shortcut. This is very intriguing. Is there an SVCD clip of this full shot to examine? Whoa, thanks! Didn’t know they were widely available (beyond the specialty shops). Will definitely check out your recommendations (the cheaper ones, that is)! Ouch! Just looking at those prices (of the “non-Pro” versions). Have mercy! BTW, those do look pretty cool. Ah, to dream. poita … YOU ARE THE MAN !! It’s probably the crush (about a 3rd of the picture area is in zero’s! – here highlighted) that makes the previous scan look like no dark detail. The brightened scan still has a large area crushed, but it’s all in the background now. Using a gentle curve on it, weighted down at the low end, produces a beautiful shot that keeps the detail (even if I don’t know how dark the shot is to be targeted). … about how Shelley was treated, and attacking a man who no longer is around to defend himself. I’d say Shelley should consult with a real doctor, a medical doctor, who also knows nutrition and deficiencies that may cause the body to malfunction. And with Shelley still in her right mind, I hope she and her agent negotiated a good cut from the TV show’s take. 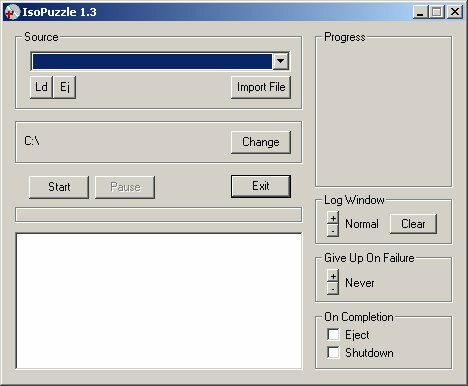 IsoPuzzle is CD/DVD recovery software. The goal of this program is to recover as much as possible data of damaged, bad burned or scratched CDs or DVDs. This version is experimental and supports only data CDs and DVDs with sectorsize of 2048 byte - Audio CD, VCD and SVCD are not supported. Requires ASPI.dll. This program is a God-send. In the past I used to buy inexpensive CDRs and DVDRs. Now I’m paying the price with a good percentage of my old disks being unplayable. IsoPuzzle is the only program that I found that will consistently recover all of the data. Further, different drives have fractionally varying alignments. A sector that cannot be read on one drive might be readable on another drive. IsoPuzzle allows you to move the saved-sector index from one drive to use for the continued recovery with another drive. Commandeer as many computers/drives as you can for tough recoveries! Ever since their first recordable compact disc in 1988, Taiyo Yuden has continued down the path of excellence, and the Taiyo Yuden DVD-R 8X is no different. It’s no wonder that you’ve come to insist on Taiyo Yuden for your blank media needs, given their undeniable reputation as one of the industry’s leaders in providing top-notch optical media products. And when it comes to choosing your destination to make your purchases, do not settle for just any other vendor – insist on LINKYO, an authorized Taiyo Yuden distributor. The Taiyo Yuden 4.7 GB White Premium Line Inkjet Hub Printable 8X DVD-R Blank Media Discs come in a 100 disc pack wrapped with sturdy plastic. The white inkjet surface allows for customization of the discs with the appropriate inkjet printers that have the disc alignment function. The versatility of this disc allows them compatibility with many industry-level DVD-R burners and drives alike. These discs offer a one-time write for 4.7GB worth of data storage and media recording of unmatched quality. Taiyo Yuden 8X DVD-R media discs are ideal for a variety of functions, such as making DVD copies, backing up or storing data, and personal or professional media recording. Taiyo Yuden used to make their own disks. Then JVC picked up production using the same disc designations. Now I see CMC has acquired it, again the same disc designations. JVC had a good reputation, but I’m not so sure about CMC (in fact, I remember keeping away from a bunch bad discs including CMC brand). But apparently this is a special production version. Here’s the scoop: In 2008, Taiyo Yuden purchased JVC’s media group, and they became one and the same, taking advantage of JVC’s royalty deals and brand recognition. There was no change in manufacturing. Taiyo Yuden still made the discs at its factory in Japan, but the part numbers and labeling changed to reflect the JVC brand. In a nutshell, that’s the story of how Taiyo Yuden became JVC/Taiyo Yuden, which is now CMC Pro - Powered by TY Technology. Whatever you call them, at the end of the day, you’re getting a great blank disc. So it looks like CMC’s Taiyo Yuden is good. In any case, always read the descriptions and get the “premium line”, never the “value line” (which are 2nds). Having said and done all that, I’ve been thinking about “archive quality” discs. Users become more and more concerned about the lifetime of the storage medium used for their sensitive data. FalconMedia Century offers the most reliable long-term storage solution for historical or sensitive data. FalconMediaCentury is certified archival grade blank media which provides the user with a safe, long term storage solution. Century blank DVD–R & CD-R media incorporates a special dye layer which provides maximum resistance against environmental degradation, and is manufactured with premium original OEM Japanese materials and technology to ensure superior archival-quality. The stability of both reflective and recording layers are the determining factors which ensure longevity of media and its data content. For extended and safe day-to-day use, FalconMedia Century is available with a UHC (Ultra Hard Coat) option – a protective layer that ensures up to 50x more scratch and smudge resistance compared to normal media. Well, then, it could’ve been the real thing! Hemmings Daily - Ask a Hemmings Editor: Were the Lola T70s in THX-1138 real or fake? … THX-1138 was filmed in 1969 and released in 1971. Lola built the T70 from 1965 to about 1969. Thus the T70s were still relatively new, though recently made obsolete in sports car racing by the appearance of the dominating Porsche 917 and Ferrari 512. … old race cars – especially ones that were considered no longer competitive – weren’t valued then the way they are now; … This all made the time Lucas was filming “THX-1138” the perfect time to snap up a couple Lola T70s for cheap from race teams looking to make room for more competitive cars.